July 1st, 2017 is not only Canada Day, a federal holiday on which we celebrate the anniversary of the 1867 enactment of the Constitution - this year it's also an extra-special celebration, because Canada is now 150 years young. People throughout the country will be celebrating the holiday with parties, outings and beach days. No doubt many will be decorating their homes in red and white, the colours of the Canadian flag. 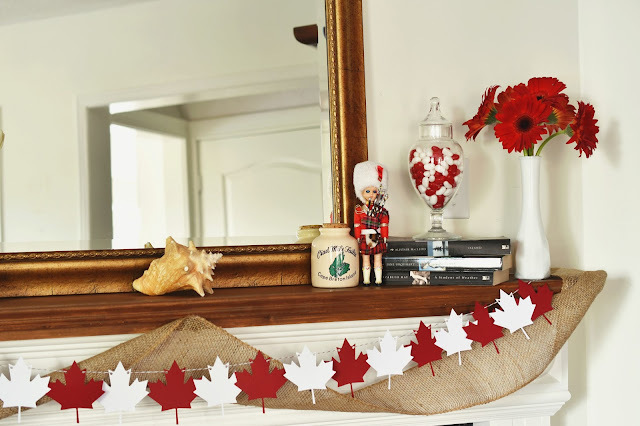 As the central portion of the flag features a red maple leaf, the maple leaf is also prominent in Canada Day decor. To celebrate, I decorated our diy fireplace mantel for Canada Day with two projects - a Canadian flag garland and a framed maple leaf print. These are both simple yet festive projects to make with your Cricut Explore Air™ or other Cricut cutting machine. 1. 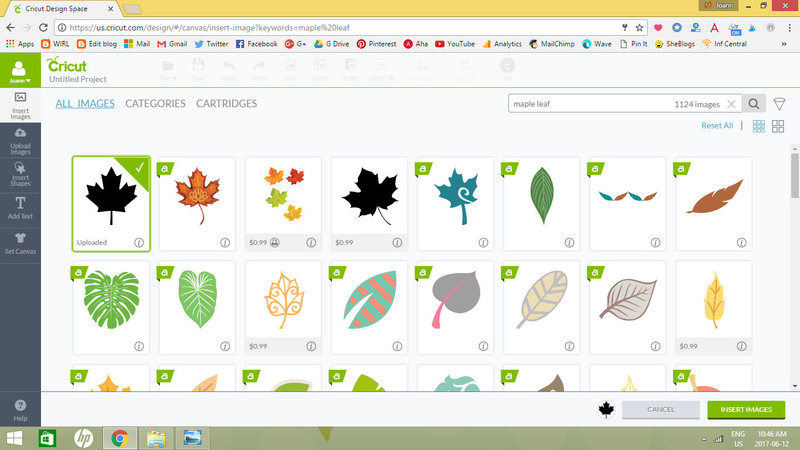 In the Cricut Design Space, insert an image of a maple leaf. I had uploaded an image previously for my Cricut iron-on tank and tote bag projects. That maple leaf image now shows up as an option when I select Insert Images and search maple leaf. 2. 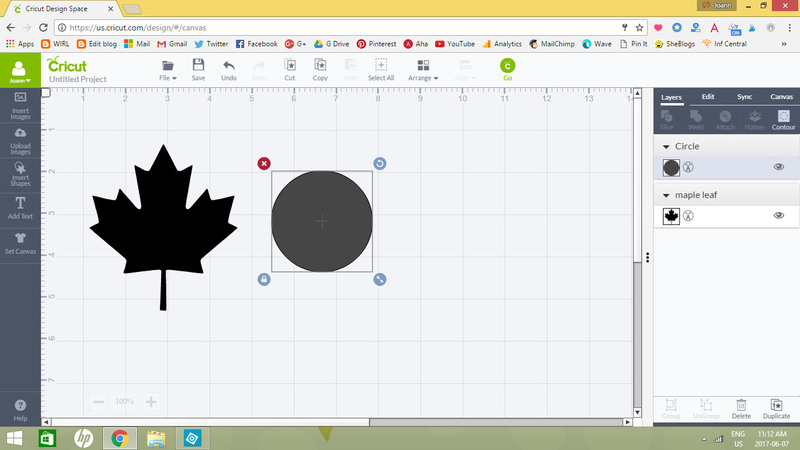 Size the maple leaf to your desired size. The maple leaf I created for my Canada Day garland is 3.5 inches wide and 3.93 inches tall. Insert a circle. 3. Size the circle down to act as a hole to run the garland's twine through. Duplicate the circle. Drag circles to desired position. 4. Weld the circles together. 5. Select All and then Slice to cut out the circles. Delete the cut circles. 6. 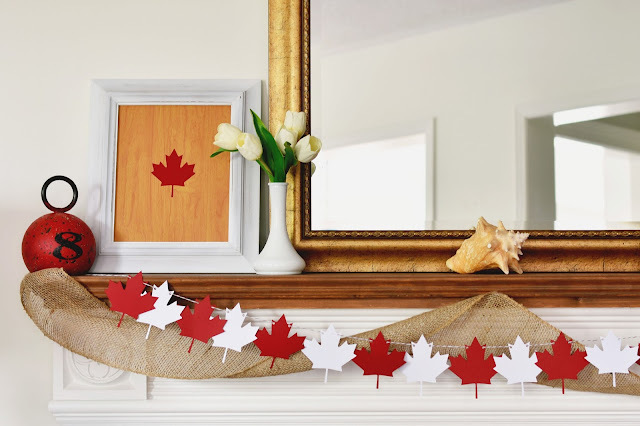 Duplicate the maple leaf to create as many as you need for your garland. 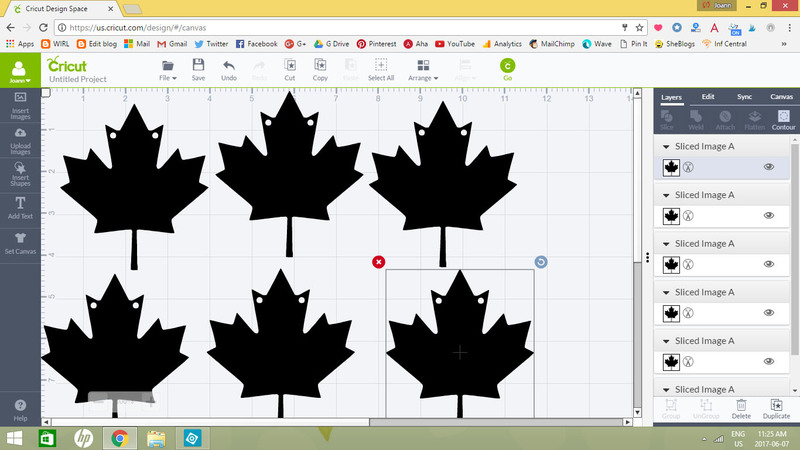 10 red maple leaves and 9 red. 8. 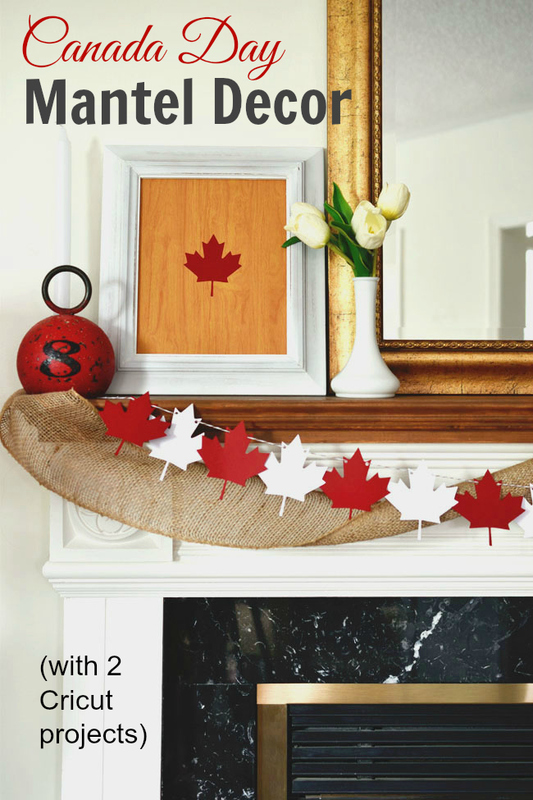 String all of the cut maple leaves onto twine (I used baker's twine) and hang. Done! Simple. 1. 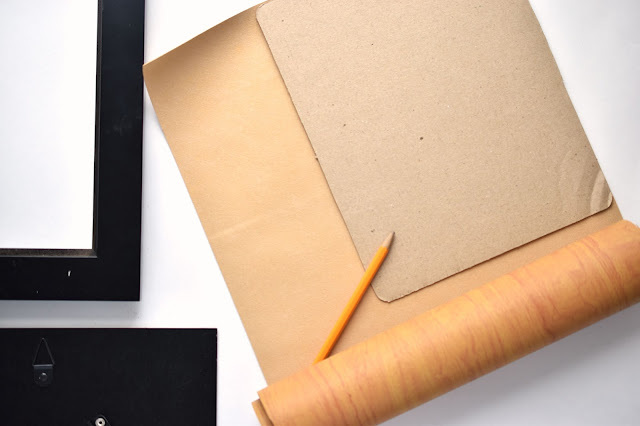 Use the picture frame's cardboard insert to trace out the background shape on the faux leather. Cut the faux leather out with your Cricut scissors. 2. 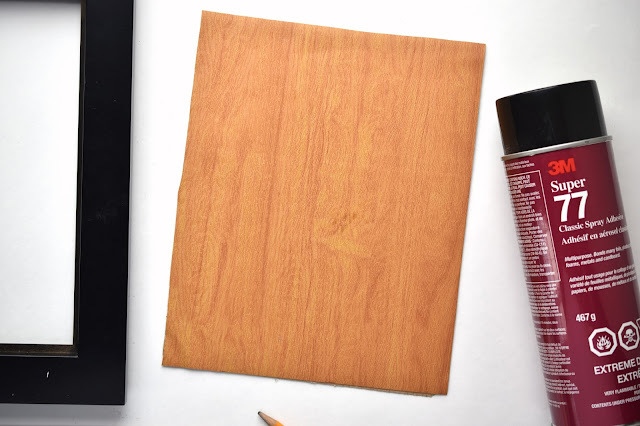 Spray the cardboard picture frame insert with spray adhesive and adhere the faux leather to it. 3. Insert a maple leaf into the Cricut Design Space. It's there if you made the garland. 4. 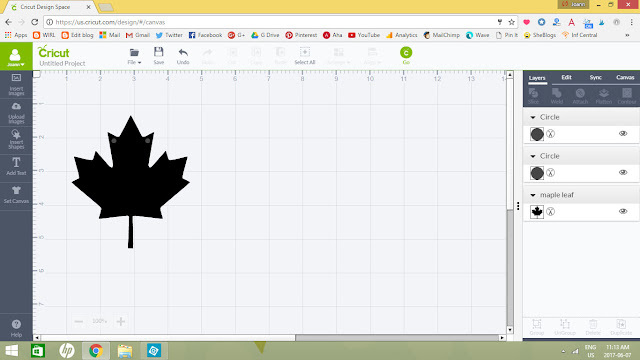 Size the maple leaf to your desired size. 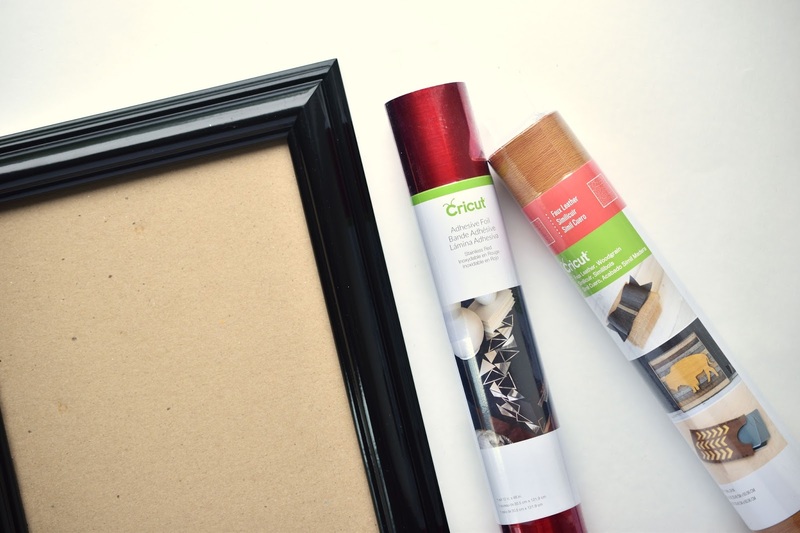 Cut out of red foil adhesive using your Cricut. 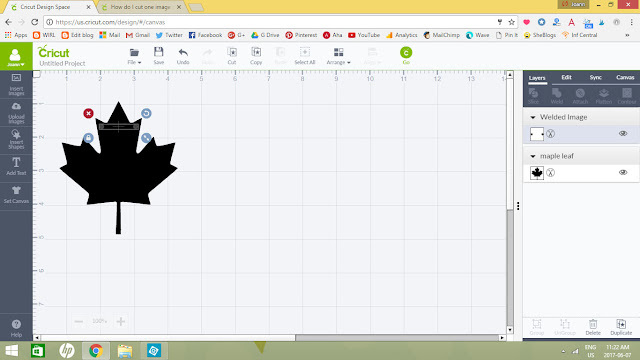 Remove maple leaf from adhesive backing and adhere to faux leather background. I added a few Canada-related items to my mantel - a little jug from Cape Breton Island, Nova Scotia, a seashell my parents gave me and a wee bagpiper a friend of my mom's in Nova Scotia gave me when I was a child. I also added some of my favourite novels written by Canadians, red and white jelly beans and a small bunch of red gerbera daisies. What different kinds of DIY projects can I make with the Cricut? If you just recently acquired a Cricut machine, you might be wondering just what kinds of projects you can make. 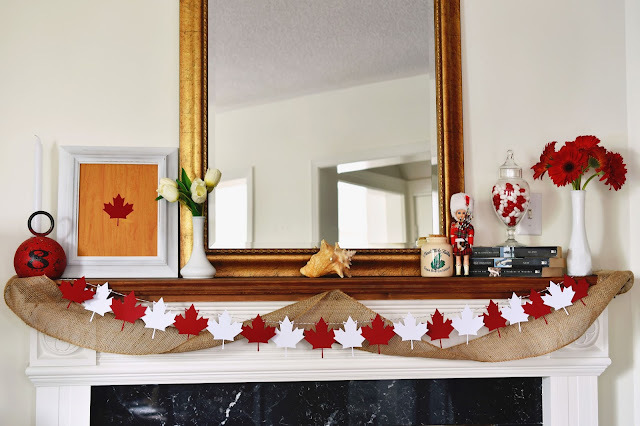 As my Canada Day maple leaf garland made with cardstock demonstrates, you can make garlands. Many many garlands. I am garland-obsessed (as my daughter likes to point out). I made this fall pennant garland previously with my Cricut Explore Air, and also this gift tag ribbon garland using old Christmas cards. You can also use your Cricut to jazz up a summer party. For inspiration, look no further than this post from Ariel, which has three amazing Cricut projects - "Let’s Party" drink stirrers, an invitation for dinner and drinks and cute leaf place-card holders. You can always visit Cricut Design Space™ for project ideas. There are Father's Day cards, cake toppers, designs to personalize your mugs and plates and text images to help you organize your craft supplies. Another fun type of project to make with your Cricut is iron-on clothing, textiles or pillows. 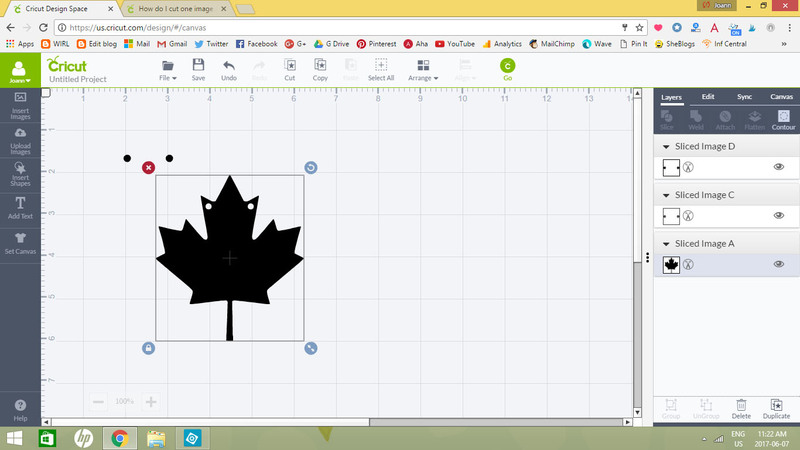 I made a couple of Canada-related projects for Victoria Day that would also be perfect for Canada Day. 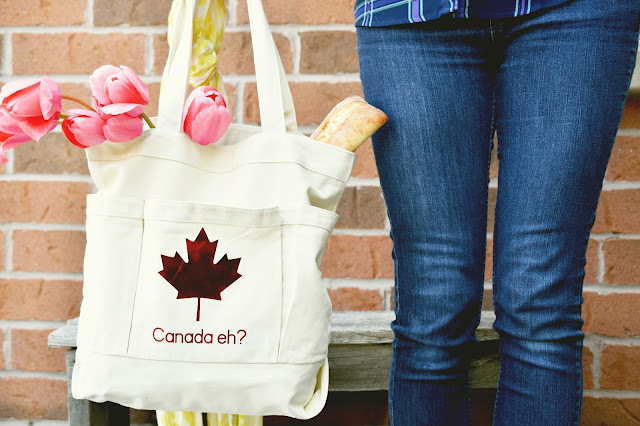 Check out this post to find out how I made a diy Canada eh? 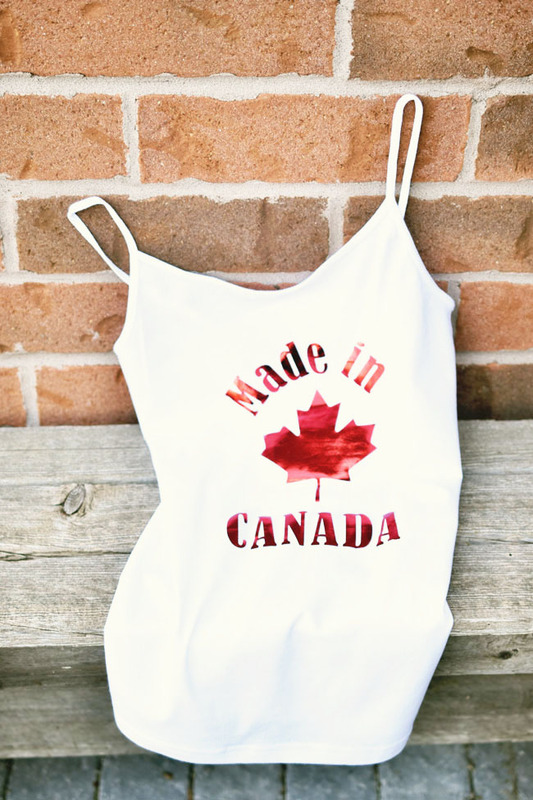 tote bag and a Made in Canada tank top using my Cricut Explore and red foil Cricut iron-on material. This was just a small sampling of the many DIY projects you can make with the Cricut. Let your imagination run wild! 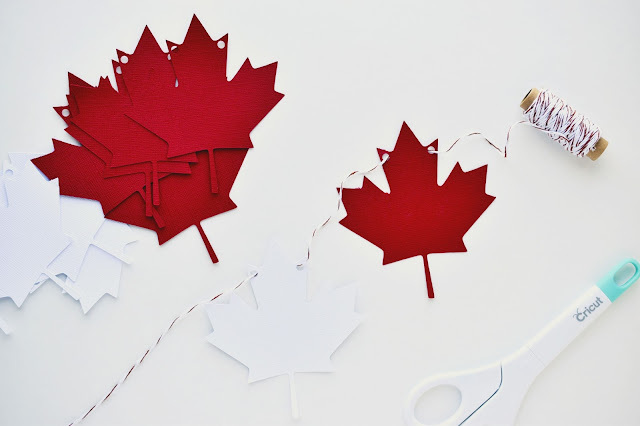 Will you be celebrating Canada Day? (Or your own country's birthday?) How will you decorate? LOVE it, so festive! I wonder if the cricut would cut through felt? I have so much red and white felt and I LOVE your banner! Very cheerful and appropriate to our Canadian celebration!